Lalueza, J.; Rius, A.; Puig, R.; Marti, M.; Martí, J.F. ; Rodriguez, N.; Amils, R.
Heavy metals in waste waters and sludge may cause significant environmental problems, and it is known that conventional recovery technologies cannot always achieve satisfactory treatment. For example, they are inappropiate to completely recover the chromium in the case of waste waters from the tanning process. Chromium can be recovered (by precipitation)from effluents that contain high concentrations of this metal. However, effluents from the later stages in present day tanning process often have a low concentration of chromium that cannot be recovered and is found in the sludge of the wastewater treatment plant (WWTP). The aim of our research is to recover and reuse the chromiun (III) from post-tanning effluents by means of a biotechnological sequestering method using acidophilic fungi. In this study, we tested acidophilic fungi capable to grow in the presence of chromiun in waste waters from various stages of a real post-tanning process. When the post-tanning process was carried out on a pilot plant scale in which conventional rechroming and neutralisation stages were undertaken and the use of additional chemicals was avoided, chromium (III) sequestration values of above 95% were obtained. As these results are so promising, further studies will focus on searching for more resistant fungal strains and determining which of the chemicals used in the post-tanning process can be avoided or replaced by alternatives. Lalueza, J. [et al.]. 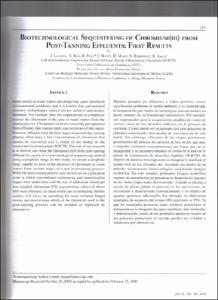 Biotechnological sequestering of chromium(III) From Post-Tanning Effluents: First Results. "Journal of the American Leather Chemists Association", Juliol 2010, vol. 105, núm. 7, p. 214-221.